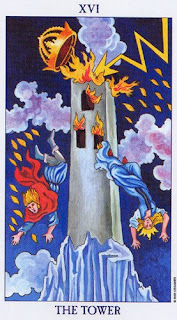 The Tower card often evokes fear, simply because it warns of a sudden, often destructive, change. In biblical times mankind built the tower of Babel in an attempt to reach God. God did not approve and devised a plan to stop them. Overnight He changed the language that they communicated in, making it impossible for them to understand one another, all attempts at communication were wrought with misunderstanding and frustrations. They were therefore unable to complete the task. Thus the Tower of Babel became symbolic of man’s fall from grace during that biblical period. A modern-day example would be the destruction of the Twin Towers in New York on September the 11th 2001. This too was in-a-sense a fall from grace in that the aftermath of 911 saw controversial laws being pushed through and passed, for good or for bad. Laws that would otherwise have taken years to go through the senate. The passing of some of these laws has caused moral points to be raised. In a personal sense The Tower could mean a sudden change of events for which we are not at all prepared. With the tower of Babel example miscommunication and frustration followed when friends and family suddenly became strangers in their failure to communicate with one another. When The Tower visits us it is therefore necessary to step back and to accept that what has happened has happened. It is too late to over-analyse the situation. We are urged to look at the bigger picture instead of being swept up by the confusion, panic, fears, and frustrations; and to ask ourselves whether we want to be part of the problem or the solution. There are ways that we can make even these frightening situations work for us. If necessary, we can find other ways in which to communicate or we can work at developing the resolve and attitude to adapt to the new situation. We are cautioned against becoming aroused by the chaos that often follows the falling of our tower, guarding against allowing the sudden change to overwhelm us. Now is the time to calmly re-evaluate our position and to find a different approach or solution to the new circumstances or events. A lot of good and positivity can come from the falling of the tower. The civil unrest present in many countries in current times is indicative of a power shift in the making. Ordinary civilians no longer want to stand by feeling powerless as their countries and large corporations rob them and lie to them. In such cases it is as if these civilians are rocking the tower, willing it to fall, so that irrevocable change may follow. It is probably no coincidence that The Tower card depicts the toppling of a crown as the tower starts to fall, possibly symbolizing the demise of those who abuse their power. On a personal level, facing life’s challenges takes courage but also teaches us a great deal about ourselves. For it is not possible to find our life’s purpose without first wrestling with our life lessons – the very challenges that steer us towards purpose fulfilment once we embrace these lessons and make allies of our nemesis.